There are plenty of ways to personalise a house, but some of the most effective, fun and exciting decorative solutions are those that sit on the walls within your abode. Walls are blank canvases in your home, offering plenty of wonderful opportunities to create a unique, original and interesting ambience. But where does one begin? Today on homify we’ve gathered 9 great designs that are sure to get your walls sparkling and stunning. Pay attention, pick your favourite ideas below and get ready to transform your home! Built into the wall, this living room makes the most of its crisp white walls with integrated shelving, and a wonderful space for the television. Additionally, the media cabinet is able to be pulled in or out, depending on the desired ambience within the room. 2. How about a 360-degree fireplace? 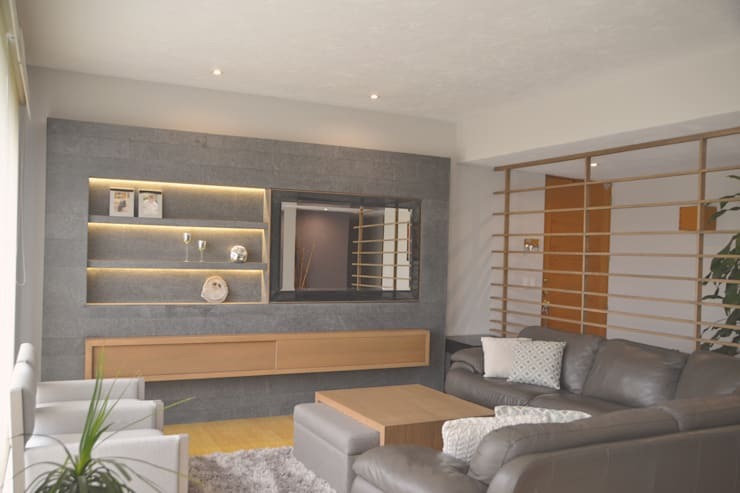 Definitely one of our favourite ways to utilise a wall, this 360-degree fireplace even includes an integrated wall-mounting system to elegantly place the television within. On the other side of the wall sits a perfect spot for an eye-catching artwork. 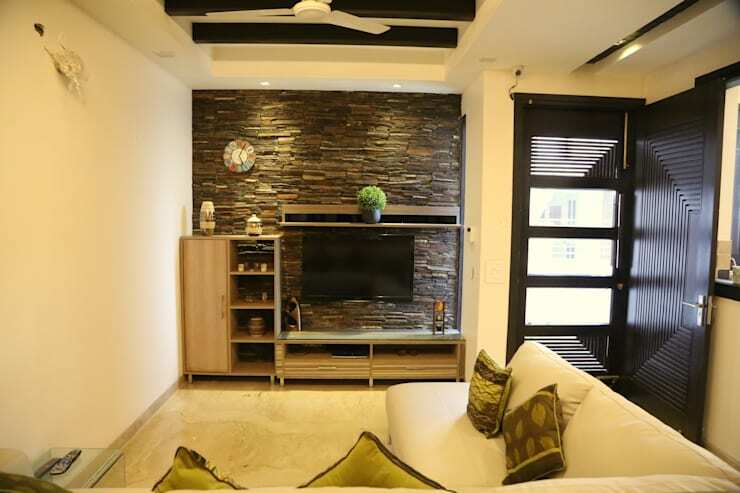 The designers of this room have employed a stone composite wall cladding to bring a sense of cool ambience and a chic aura within the space. Next we have the ultimate media-lover's dream! Eye-catching and impressive, this timber-clad modular setup is definitely going to impress. 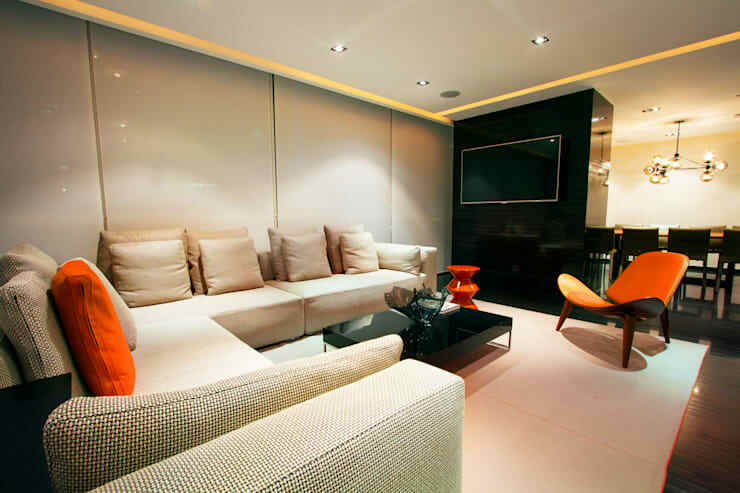 Recessed lighting is certainly only one of the wonderful features that have been included on this wall. Sometimes less is more when it comes to decorating a stylish home. This wall decor consists of a series of shiny wall tiles, which impart a sophisticated and elegant aesthetic, especially when paired with bright organe accessories, black dividing wall and bright downlights. Colourful and playful, this next wall is going to prvide you with plenty of ideas. Embrace your inner child with some eye-catching bulbs, books and vintage toys. 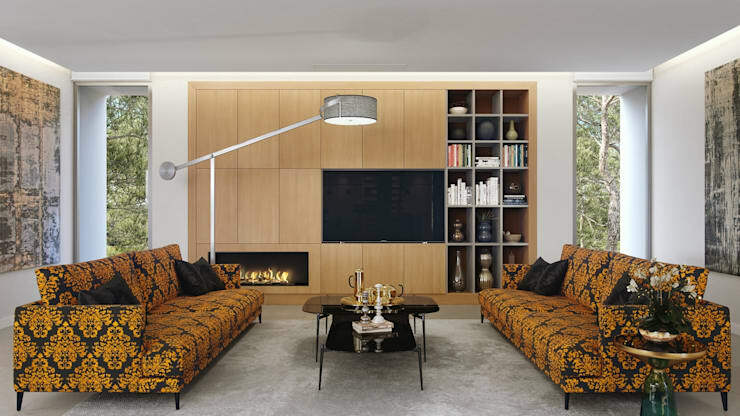 Recessed lighting is situated on each of these integrated shelves, along with a matching mirror, while the wall-mounted shelf offers storage for the home. Why settle for a blank wall, when you can have an engaging and exciting one? 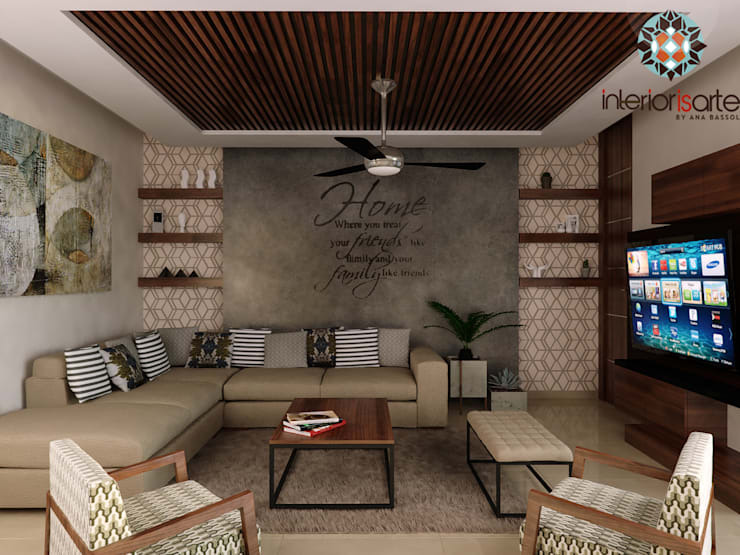 These wall shelves offer room for your most eye-catching accessories, while the concrete textured central area boasts an aspirational quote. 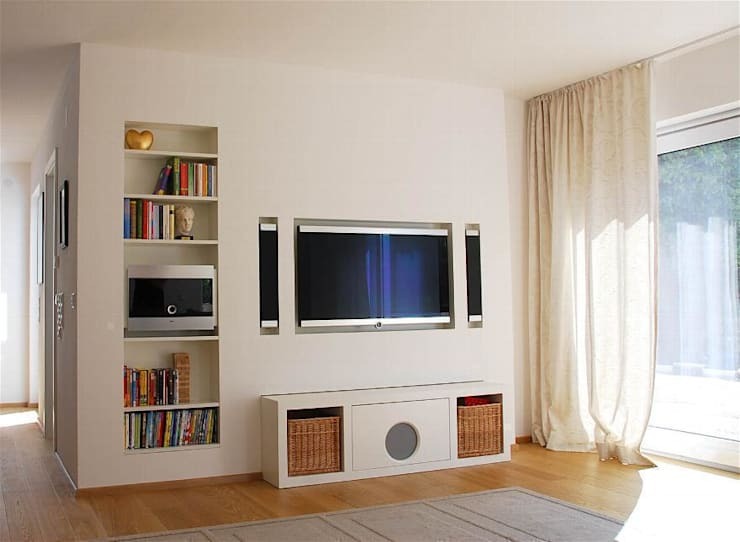 This crisp white wall has been adorned with a range of brilliant and usable features. 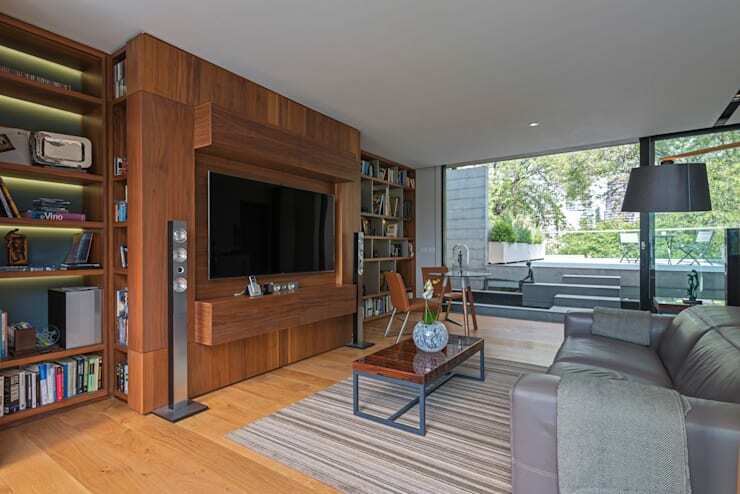 Clad in timber, the space contains a television, exposed and hidden shelving, along with beautiful fireplace.